The other day I stopped by my local fruit stand to pick up some beautiful berries for my chia seed jam. The grocer called me over. “Hey Megan, I’ve got some bananas for sale. $5.00 for 50 lbs.” $5.00 for 50 lbs of bananas? My heart raced for a moment as images of banana smoothies, banana breads, and banana ice-creams danced through my mind. “Yes, I’ll take the box!” How could I refuse an offer like that? Smiling smugly, I struggled to put the 50 lb box of bananas into my trunk. Once home I unloaded the bananas and got to work. Since they were fully ripe (why I got the great price) they needed to be peeled and frozen right away. After about an hour, 50 lbs of bananas had been feverishly peeled. My freezer was already fully stocked with bananas, but with some careful rearranging, I managed to get another 50 lbs in there. My freezer now barely opens. Stuffed to the brim with bananas. I need a banana intervention…somebody help me…. Luckily for me (and you) the stats on this blog tell me that the banana ice-creams are some of your favourite recipes. I am here to give you what you want! 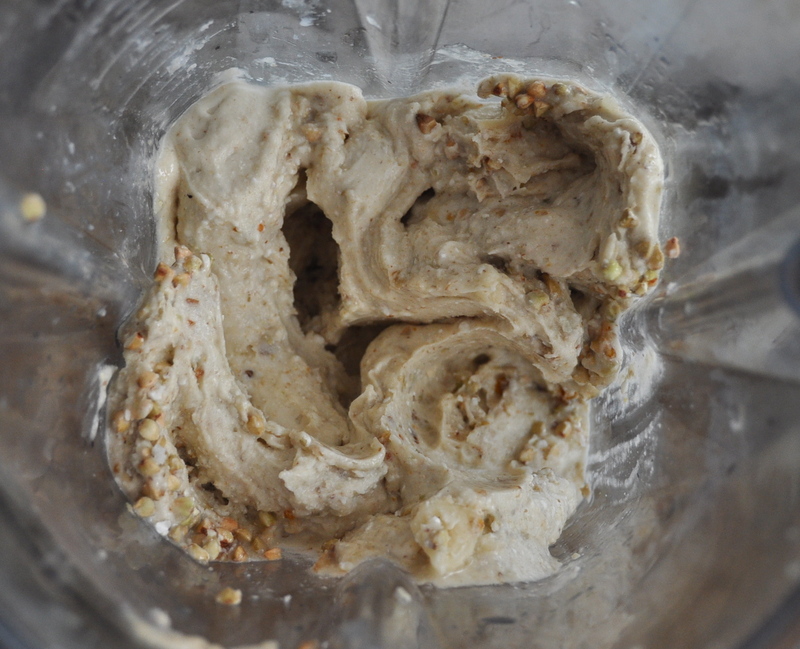 Today I share a recipe for Maple Caramel Crunch Ice-Cream which sneaks in an unusual ingredient. I predict the popularity of buckwheat will begin to take off (following in the footsteps of chia and hemp…) This little seed is a complete protein and fairly high in the macronutrient (the 1/2 cup in this recipe contributes 12 grams). Personally, I never worry about my protein intake (I know I get more than enough on my veggie diet) and love buckwheat instead for its high levels of fiber, manganese, iron, magnesium, folate and other nutrients. I love that it is cheap, accessible, and versatile. I prefer the raw buckwheat to the toasted kasha variety. If you have the option, choose raw for this recipe. As with all our nuts and seeds it is important to soak them, however buckwheat has a relatively short soaking time. If you have the foresight, soak overnight. If you just really need to get some ice-cream in you, the buckwheat will be ready after 20 minutes of soaking . I love that the buckwheat and dates don’t fully break down in this recipe. 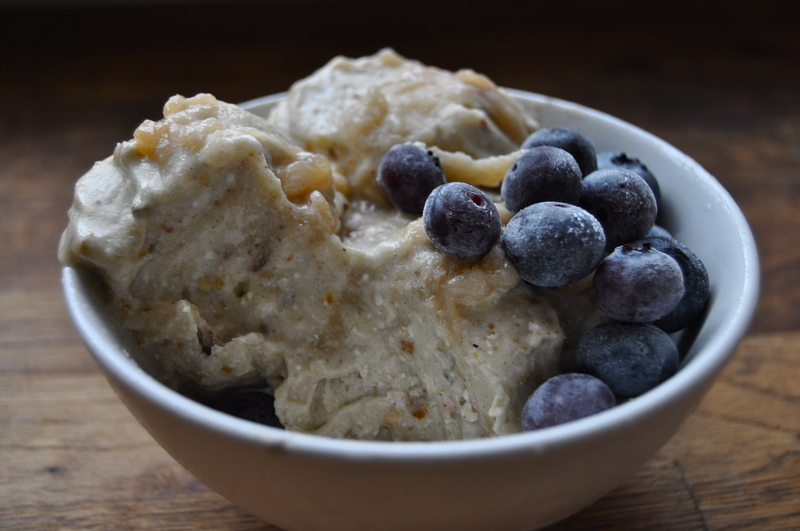 When you are eating the ice-cream you will get little crunches of buckwheat (which taste like the best granola), and little bites of date (pure caramel). Yum. Put all ingredients in a saucepan over medium low heat. Stir to melt coconut oil and combine. Once ingredients are combined take off heat. 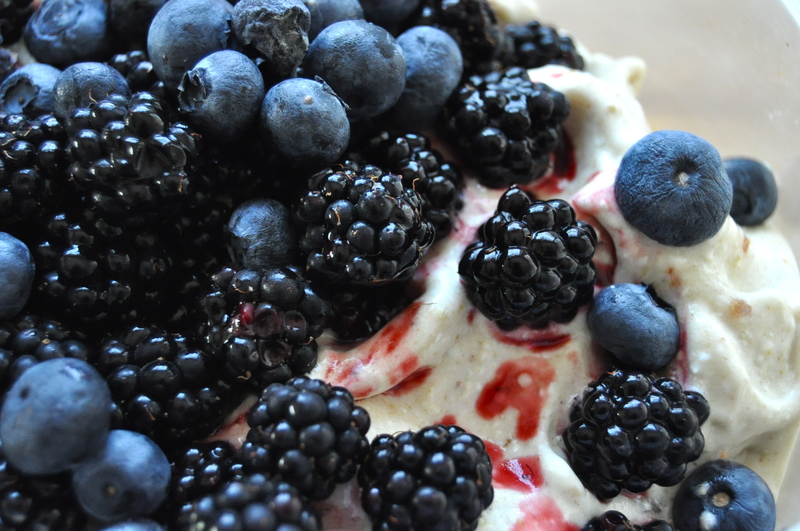 Cover ice-cream and sauce with berries or fruit of choice. I fell in love with the combination of blackberries and maple. Try it. Devour! 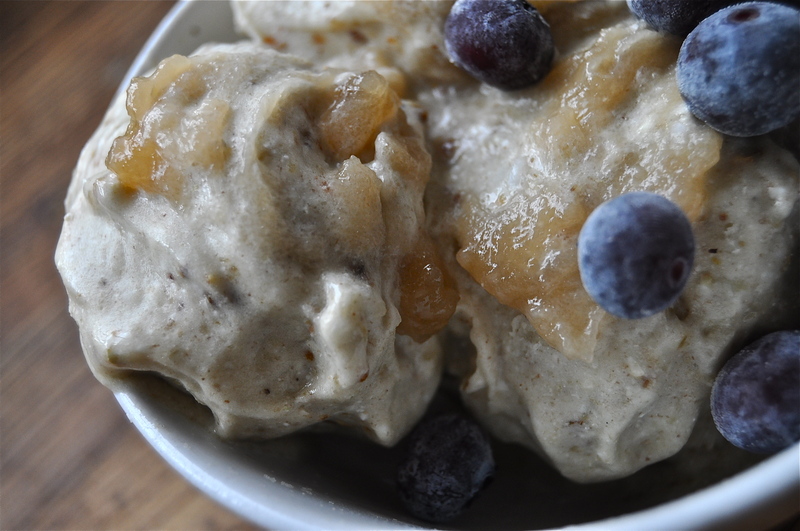 This entry was posted in dessert, raw, snack, vegan, vegetarian and tagged 80-10-10, banana ice-cream, caramel, dairy free, easy, gluten free, healthy, maple, raw, recipe, summer, vegan. Bookmark the permalink. Also am interested, what did you do with all those peels? And… please keep us on top of everything you make with all these bananas.